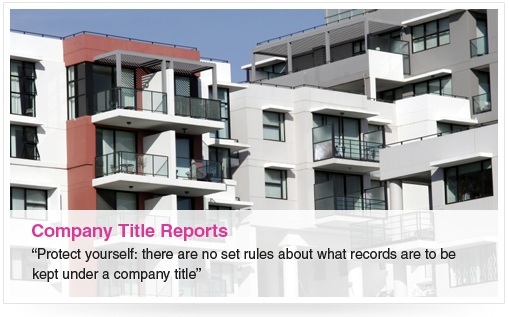 Before you purchase a flat, unit or apartment held under a Company Title, make sure you order a company title report from Pink Inspections. Why? Because both the value of a company-titled unit and your quality of life can beheavily influenced by the contents of the company records. What you get: Company Title Report, carried out by a experienced, qualified and insured inspector. What Is A Company Title Report? The property title is the proof that you own a property. A Company Title is similar to a Strata Title, which means you’re part of what’s called a body corporate—the entity that controls a building. However, with a Company Title, you’re the shareholder of a private company that all the property owners in a building own. When you want to lease or sell a unit, the ‘company’ must approve the transaction. It’s a bit of a technicality but you don’t really own the real estate with a Company Title: you receive shares in the company that owns the property. With the ownership of the shares, you gain the right to live in your part of the property. With a Company Title inspection, you’ll discover what you need to know about the way the property is organised—and the history of the property. What Will A Company Title Report Cover? If it’s possible to rent the property. Whether you may need to be interviewed by the Board of Directors. The full obligations and responsibilities of the shareholders. The financial position of the company and any current liabilities. The management of common areas. How much power the directors get. Restrictions that can be placed on any tenant. Information about ongoing maintenance and repairs. Common areas, parking spaces, storage space, and what you can, and can’t do, on a balcony. What the directors can and can’t do. The report covers extremely important information you should know before buying a property. Unlike strata titles, there are no set guidelines about what records have to be kept under a company title. For this reason there’s a lot of variation, and it’s essential that youunderstand the details of what you’re buying before you “sign on the dotted line”. This report provides you with the information you need to help you make a wise purchase decision. Click here to order a company title report. FAST Service: We Guarantee to deliver your Company Title Report within 48 hoursof gaining access to the relevant documents or it’s FREE (applies to fax or email delivery; excludes weekends and public holidays). Quality Reports : All reports are prepared by an experienced, qualified and insured inspector. You’ll be pleasantly surprised by the concise, easy-to-read format of your report. Personalised Service: We’re happy to pay particular attention to any areas of concern that you may have at no extra charge. Our inspectors also make themselves available to discuss the findings of your report. Our clients include over 600 conveyancing and legal firms who trust us to perform company title inspections for their clients. To order your Company Title Inspection Report now, Click Here to Order Online orCALL 1300 737 879.